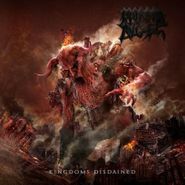 Death metal stalwarts Morbid Angel's ninth album Kingdoms Disdained is a welcome return to form after 2011's Illud Divinum Insanus. Drawing on the sounds of the first three albums with singer Steve Tucker, these tracks deliver the speed and intricate solos, especially on the first half of the record. Trey Azagthoth's riffs are catchier here, for example on the opening song, “Piles of Little Arms,” and drummer Scott Fuller brings an impressive urgency and intensity to stellar tracks like "For No Master."